Remember when we went to Bells? Well after our enormous degustation dinner you wouldn’t think we would be wanting a huge breakfast but it’s amazing what a bit of sea-air in a country setting will do to your appetite. Breakfast at Bells is served from 8am until 10am. 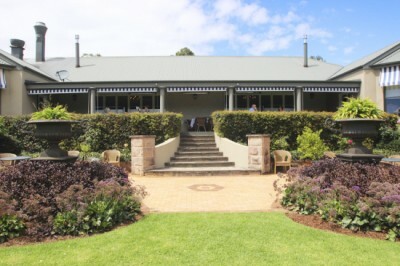 We sat on the verandah where there was plenty of warm sunshine and the smiling and friendly waitress filled our water glasses and brought over the morning’s newspaper. Ella Fitzgerald music was playing softly in the background and the atmosphere was serene and peaceful. The tables were set more casually than they had been the night before; gone were the blue water glasses and white paper covered the starched linen tablecloths. The continental breakfast is served buffet-style while the hot breakfast is made to order. The waitress asked us what hot beverage we would like to order and there is an extensive range of loose-leaf Pickwick teas as well as some fine specialty teas available however, Carl wanted to kickstart his day with a more aggressive caffeine shot and ordered a soy cappuccino. We went inside to peruse the buffet and it was refreshing to see there was nothing sitting in bain-maries. Hot food always tastes better if not left sitting in a warmer. Everything is beautifully laid out and instead of being in one long line it is arranged in clusters around the dining room. 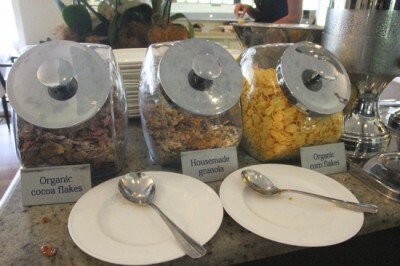 I was super-impressed with the amount of organic foods on offer including cereals. 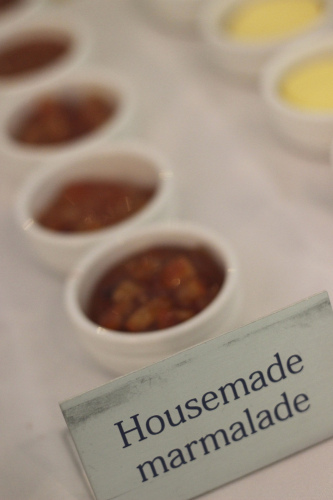 As well as an impressive organic selection, there is so much available that’s house-made. 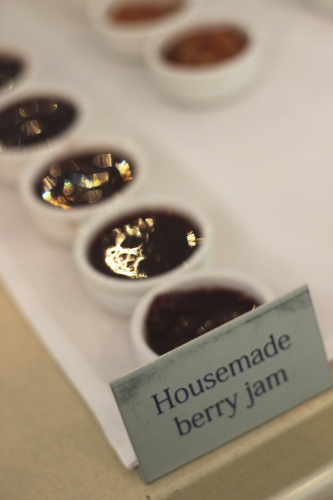 There were three varieties of house-made bread, house-made banana bread, bircher muesli and preserves like jams and marmalade. 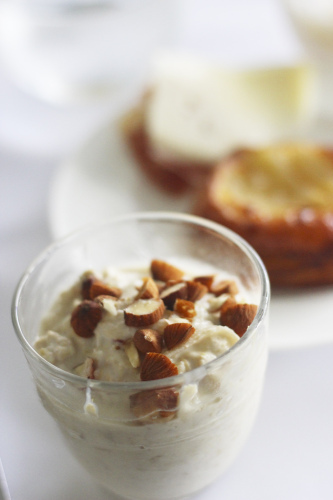 I started with the bircher muesli that had plenty of grated apple in it and a pleasant crunch from the toasted hazelnuts. 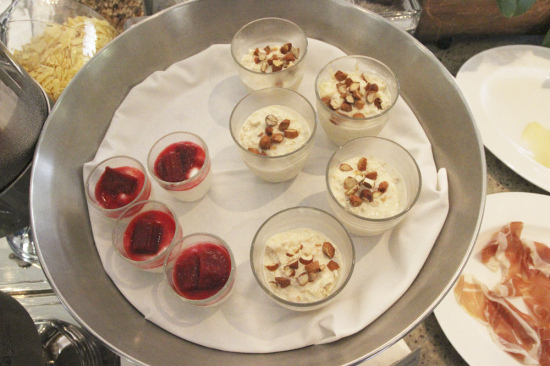 Carl had the house-made yoghurt with stewed rhubarb that’s grown in the vegetable garden. 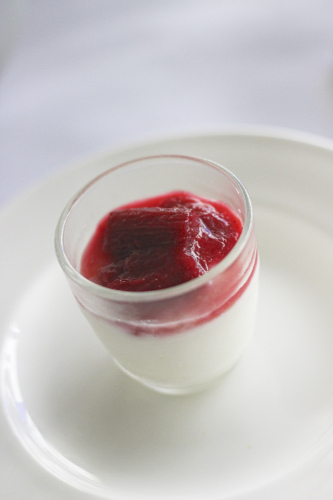 He loved the smoothness of the yoghurt and the sweet/tart combination of the rhubarb. It would be a crime to leave without experiencing the made-to-order hot breakfast so a had a look through the menu. All hot dishes are priced at $15.00 which I think is very reasonable for a 5-star boutique resort. 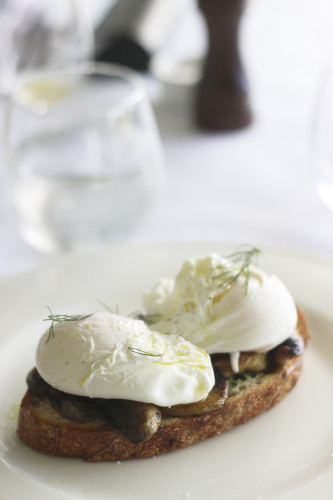 I ordered the grilled mushrooms with parsley puree, poached egg and polenta sourdough. It was exciting to know the eggs come from the free-range chickens living on the property (there’s about 35 of them), and that the parsley is grown in the herb garden and that the polenta sourdough is made on the premises. 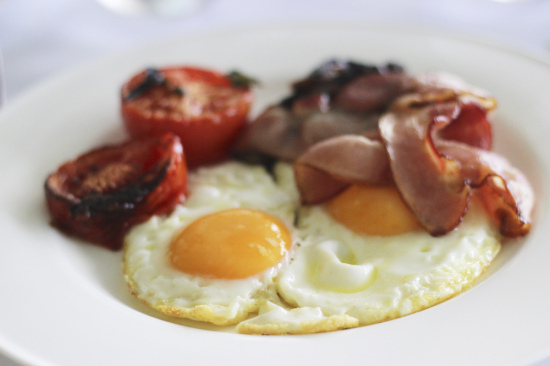 The poached eggs were perfectly cooked and I loved the parsley puree – I’ll be trying that at home! Carl was initially disappointed not to see Eggs Benedict on the menu as whenever we are anywhere, that is his preferred option! However, all was not lost because he ordered the ‘Bells Breakfast’ which is two eggs anyway with smoked bacon, roast tomato, mushroom and herbs. He chose fried eggs and put them on top of a slice of toasted seeded sourdough and had no complaints. 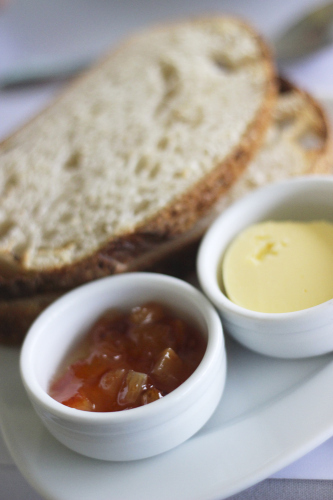 I couldn’t leave without trying the house-made marmalade so it was back up to the buffet again to toast the sourdough and then I slathered it with butter then scooped the marmalade onto the toast. I love marmalade and this was a winner with plenty of chopped peel and some sweetness along with a hint of bitterness from the rind. I hate to say it but I think Carl had not only the toasted sourdough with marmalade but also a few pastries! 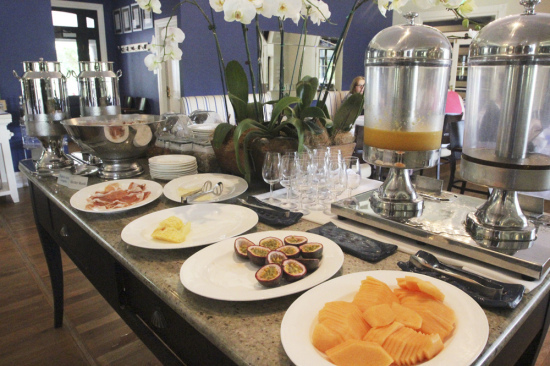 After a relaxing read of the paper we were off for a wander around the resort – a gentle stroll after a leisurely breakfast is always a great way to move on from a meal. 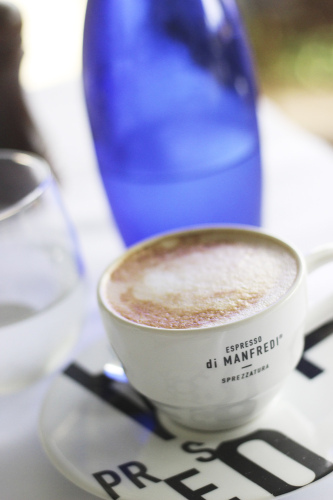 Breakfast at Manfredi at Bells is available for in-house guests seven days a week. 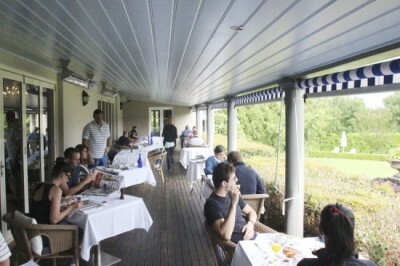 Hotly Spiced and Crew enjoyed breakfast at Manfredi at Bells as guests of Brian and Karina Barry.